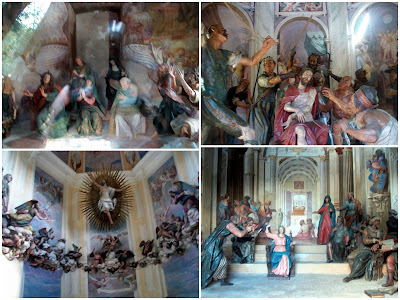 You don’t have to be religious to appreciate the beauty and art that abounds in Varese. Being there is an adventure for both the body and the spirit. Earlier this month as part of a three week whirlwind tour of Lombardia, Piemonte, Le Marche, Abruzzo and Emilia Romagna, we spent and afternoon in Varese. It is easy enough to walk up the impressive panoramic slopes of Monte Velete along the wide paved winding 2.5km path with a gradual climb of 300 metres. You are rewarded by the beauty of the buildings, the dazzling art and remarkable landscape with spectacular views overlooking Lake Varese and the plains and valleys of the area. The atmosphere is one of peace and serenity. A new surprise awaits you around each turn in the path. You pass by 14 beautiful chapels along the way and although you cannot enter any of them, you can view the amazing interiors through the windows. Each chapel is embellished with richly decorated frescoes, murals and life-size painted terracotta figures theatrically representing a scene from the Mysteries of the Rosary. They were created by some of the finest painters and sculptors of the 1600s, including Mazzucchelli, Prestinari, Nuvolone and Ghiandone. The three arches, three fountains and all of the chapels were designed by Lombardian architect Giuseppe Bernascone and were built in the style of the Borromean era. Work on the project started in 1604 and was completed 94 years later. The chapels are all different in shape and combine beautifully with the stunning natural surroundings. Walking along the path you will be equally enchanted by the panoramic views of the lakes, the valley, and the Art Nouveau style villas found along this ancient path. In several spots there are open galleries from which you have breathtaking views of the plains of Lombardy, the Po valley, the forests and the Lakes of Varese, Comabbio and Monate. At the end of the journey, the pretty mountain village of Santa Maria Del Monte welcomes you with inviting restaurants, many with panoramic terraces that overlook the valley. The final chapel (containing The Coronation of Mary) is found inside the Sanctuary of Santa Maria in the village. On reaching the summit in Vellone, I was excited at the prospect of taking the funicular railway back down, but was disappointed to discover that in August it only operates on a Sunday! (We were there on a Friday). Nevertheless, walking back down wasn’t as difficult as I thought it would be and took half the time too. The Sacro Monte di Varese is one of 9 World Heritage Sites in the Piedmont and Lombardy area. I first learned about the existence of these Sacri Monti through my friend Dana’s wonderful blog Stresa Sights. To find out more about the other ones, check out her fascinating post The Sacri Monti Near Stresa. So if at any time in the future you are in Milan or any of the nearby areas, don’t miss the chance to explore the beautiful Sacro Monte di Varese. It is definitely worth a visit!